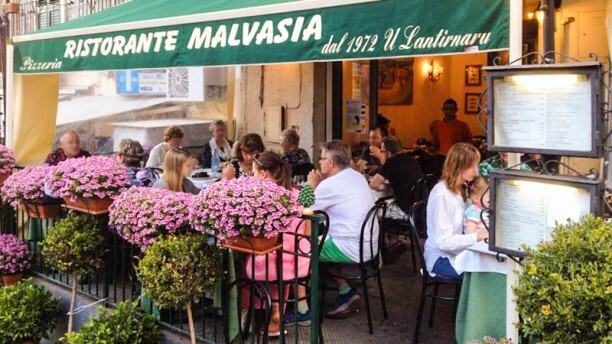 DUE PASSI DAL DUOMO - Il Ristorante Malvasia si trova nel cuore di Taormina, giusto a due passi dal Duomo medioevale. Il locale si presenta come un ambiente decisamente semplice, quasi spoglio, ma la cordialità del personale mette a proprio agio i clienti. CUCINA SICILIANA - Il menù è ricco di proposte tipicamente sicule. Si va dalle panelle, che vengono servite come antipasto, agli involtini di pesce spada e, naturalmente, non mancano la pasta con le sarde e l'impepata di cozze. Coloro che invece preferiscono un pasto meno completo, possono optare per le pizze che vengono preparate in tanti modi diversi. A BUON PREZZO - Rispetto agli altri locali cittadini, la struttura propone dei prezzi decisamente convenienti. We went twice to the restaurant in our week in Taormina and both times the food was good. I had pasta Norma (of course) on our first visit and it was really tasty and when we went back I had the fritto misto which was huge and very good. The service was good and the price was very fair so I would recommend this restaurant. Very good fish pasta, clams and shrimp. Calamari grittier was very fresh. Service was excellent. Lovely atmosphere. The staff were very helpful and friendly. The food was delicious, we had swordfish which was perfectly cooked. Very friendly staff, excellent food and nice atmosphere. Take account to make a reservation. Many Sicilian eat here so it is not a tourist trap. Perfect local restaurant, great family owned business atmosphere, delicious food. A memorable experience. Great food from a great family restaurant . The ‘ Brother ‘was wittty with his service and atttention to detail was excellent from the team . Excellent cuisine well prepared and very friendly service. Reservations recommended. Great ambience . The Family that owns and runs the restaurant is very friendly and informal making you feel at home. The swordfish of the day was ok but the pasta was very good. Fair price. Great, Great, Great, Everyone LOVED It !!!!! Great place for great food. Need to allow time to park and bus/walk as parking is tight. Excellent food, great attention and good price quality for overpriced Taormina!!! It is not worth for going with booking. The pasta stretched out and it was far from Al dente. We never go there. Everything was perfect and that says a lot when you have three fussy eaters like my children. The mixed seafood entre was huge and so fresh. Must have. Wife’s cotoletta was so big it was half off the plate. Service was freindly and fast. We had a great meal here. The seafood pasta was particularly impressive. House wine was excellent. The service was good but quirky. Would recommend Malvasia to anyone. Good place; friendly service; food was ok, a bit heavy for us in the end but tasty and nice. If you are after a hearty local meal, worth going. Great food. Good service and very reasonably priced.